Home / Pres. Rody Duterte / Viral Girl / Viral Stories / Heartbreaking Viral Video of Innocent Girl Telling Tatay Digong to "Never Give Up"
Heartbreaking Viral Video of Innocent Girl Telling Tatay Digong to "Never Give Up"
An innocent English-speaking innocent girl is currently making the rounds online because of her heartbreaking appeal to the President of the Republic of the Philippines, Pres. Rody Duterte. The innocent-looking young girl posted a message on social media with the help of her mother encouraging the Philippine President to continue his war against drugs and never give up on protecting the world particularly the Filipino people. The heart-warming video touches the soft sides of every Filipino netizens who commended the young girl's courage to support the President who became the target of bias reports not only from the Philippine media but also their international counterparts. 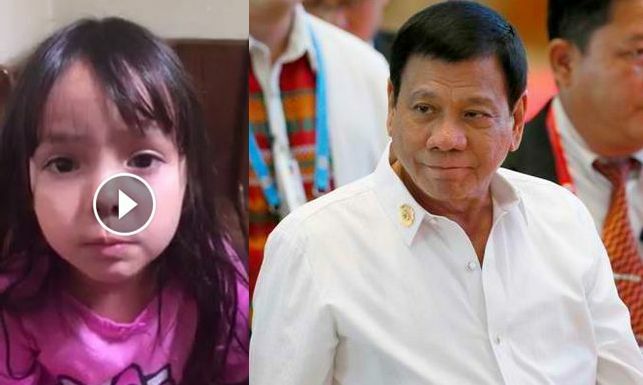 The young girl shared her heartfelt message in a viral video which was popularized by the Facebook Page Duterte Bato Supporters. "Tatay Digong, Don't give up on being a President, if you give up and don't protect the world, then everybody in the country will be killed." she said. The innocent-looking young girl added further that "You're a savior because you're the one that got picked in being a president, everyone wanted to pick you, because you're the one that wanted to be President, and you're the best President ever," she added. The newest viral sensation on Facebook also noted that "Bad guys would want to be the president, they'll take your spot," warning the President of the bad guys. "Don't forget to never forget to not give up to be a President," the young girl stated.